Do you consider yourself smooth, cool, nutty or fruity? 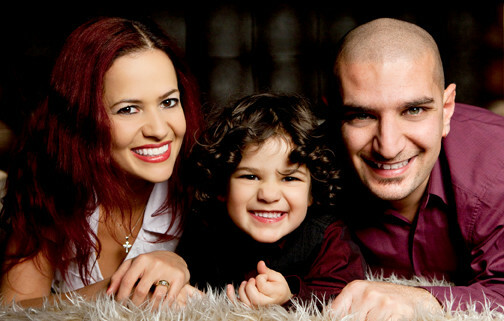 Tough question, I know, so I have asked little man for help and he said that I am smooth. I am not too sure what he meant, but I chose not to ask any further questions just in case I did not like his answers. I was pleased to find out that I am smooth just like the new Choc’o Brownie flavour Oreo. This delicious cookie features a silky smooth chocolate brownie flavoured crème centre in the traditional cocoa biscuit that we all know and love! The exciting flavours range offers a variety of flavours to suit different personalities. If you are cool, you will love the Mint flavour Oreo, while nutty ones will go crazy for the Peanut Butter flavour Oreo and fruity characters will adore the Strawberry Cheesecake flavour Oreo. 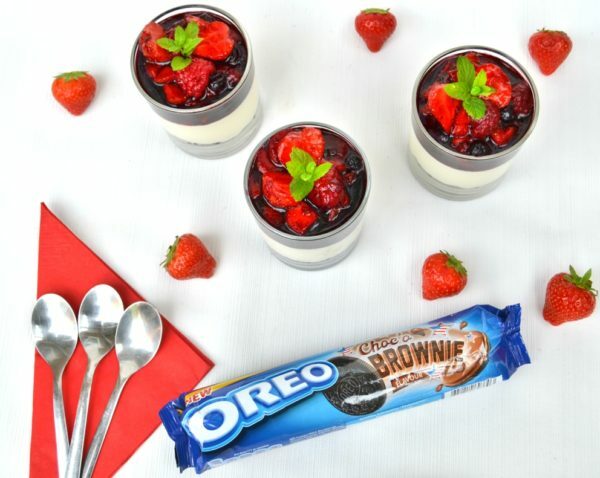 As I also consider myself cool sometimes, with a touch of fruitiness, I decided to make a dessert incorporating Choc’o Brownie flavour Oreo with strawberry and mint. Instead of a traditional cheesecake base, I added a chocolate brownie twist to the base by crushing Choc’o Brownie flavour Oreo at the bottom of the individual cheesecake glasses. This recipe is quick and easy to make and it doesn’t involve any baking. It is perfect for those days when you fancy something sweet. The smooth chocolate brownie flavour cookies are beautifully complemented by the silky cream cheese and the fruity mixed berries topping. The no bake cheesecake was a massive success with the whole family and so was the new Choc’o Brownie flavour Oreo. Place the biscuits into a freezer bag, seal the bag and crush the biscuits with a rolling pin. Cover the bottom of the individual glasses with the Oreo crumb. In a large bowl, whisk the cream cheese at room temperature until completely smooth. Add the condensed milk and whisk for a couple of minutes until combined. Mix in the vanilla extract. The mixture should be fluffy and light. Spread the cream cheese mixture over the biscuit base and chill in the fridge for 3-4 hours. Once the cheesecake has set, make the mixed berries sauce by combining the strawberry, raspberry and blueberry with sugar in a medium saucepan. Bring the berries mixture to a simmer over low heat until the sugar has dissolved, around 5 minutes. Remove from heat and let the mixture cool before pouring over the cheesecake. If you prefer mini desserts, you can make the cheesecake in shot glasses. The recipe should be enough to fill at least 10 shot glasses. 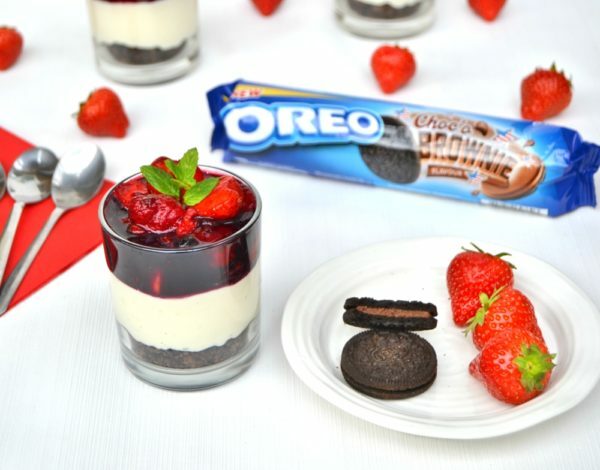 This recipe has been created in collaboration with Oreo. 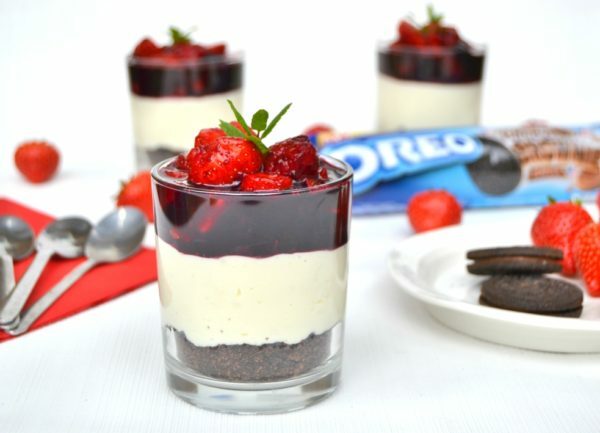 33 Responses to "No Bake Cheesecake Recipe with Choc’o Brownie Flavour Oreo Base"
This looks like the perfect dessert! Yum! Oooooh. Using oreos as a cheesecake base is so inventive! I can imagine how delicious it was. I never been a cheesecake fan but this looks like a good option that I could serve over Christmas to guests. Thanks for sharing the recipe. Hands up I love a good no bake recipe and I love the sound of this cheesecake as it is something I have been getting into more of late too! A no bake cheesecake? Sweet,that means one less dish I can burn to a crisp. I used to like Oreos as kid but I just can’t don’t them other then in a milkshake. I am a fan of cheesecake and this recipe looks amazing. I will try it sometimes soon. Cheesecakes are one of my favorite desserts and a no-bake cheesecake recipe, this should be great. I would love to make this someday, great comfort food and also who doesn’t want a good dessert? That’s a lovely looking dessert – the only challenge is not eating all the Oreos straight of the packet while you’re ‘cooking’. These look amazing and I love that they are no bake too! These look absolutely amazing! I love oreos, and I love cheesecake, and I love oreo cheesecake so I will be trying this out at some point! This sounds delicious! And something that my brothers will devour. This sounds delicious. I love Oreos! I really like no bake desserts when I want to create something homemade but don’t have too much time on my hands. I just love no bake cheesecakes. I have to pin this! 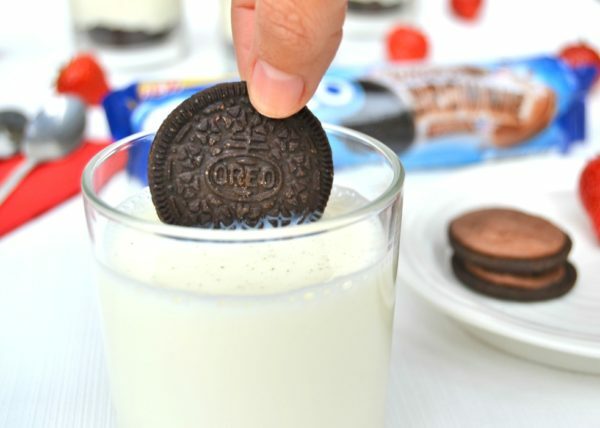 What a great way to use Oreos! Anything that just requires a fridge is good for us and love the simplicity of this recipe! Oh wow that looks great! I can’t say I’ve ever made cheesecake, but I could try this! Anything Oreo gets a big thumbs up from me. I haven’t made a cheese cake in ages. This looks like my idea of heaven! We LOVE oreos in our house and cheesecake too, I so want to try these! I’ve saved this on pinterest as well, your recipe is so easy. Looks super delicious! I love oreos. Great idea for a crust. Oh how I wish oreos were gluten free. This is a great idea to add flavour to your cheesecake, other than the usual digestive biscuits. I have seen the new oreos in the stores. It’s nice that they brought them to the UK as well, I have tried them years ago in Asia and they were delicious. 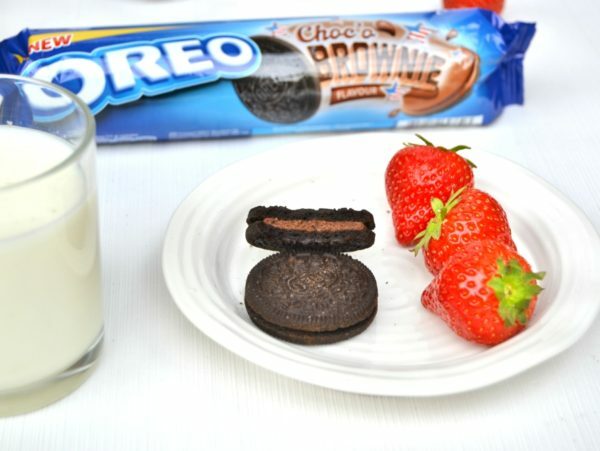 Wow I haven’t tried the Choc’o brownie Oreos…what a fantastic idea for a cheesecake! Yummy! Gosh that looks so good! I do love me a nice quick and easy cheesecake recipe. Cheese cake and Oreo together in one line excited me more than I anticipated. Great recipe.. I really like that flavour of Oreos. Great recipe, thank you!